VENEZUELA’S National Assembly president, Juan Guaido, yesterday declared himself interim President of that country, in direct conflict with incumbent Nicolas Maduro, opening the possibility for further unrest in a country already overcome with political and economic strife. In retaliation, Maduro has given the US 72 hours to remove all its diplomatic personnel from the country. National Security Minister Stuart Young said yesterday that TT “stands ready to assist,” even offering mediation if necessary, and while he neither endorsed nor denounced Guaido, he emphasised that this country’s foreign policy remains one of non-intervention in the affairs of sovereign nations. “Obviously we don’t want to see a massive disruption taking place. That has direct effects for TT,” he told reporters at a press conference at this Temple Court office on Abercromby Street. As Venezuela’s economy free falls, more and more people facing unemployment, hyperinflation and starvation have started fleeing the country. With just 15 kilometres separating TT and Venezuela’s Caribbean coast, there has been an influx in Venezuelans trying to enter this country, often illegally, looking for work. Young said this country has been working to improve border security, and this was something “high on his priority list.” He added that he had requested Foreign Affairs Minister Dennis Moses, who is also a Minister in the Ministry of National Security, to set up a meeting between TT and Venezuela to discuss border control from a TT perspective. When asked directly about Guaido’s challenge, Young said as far as he was aware, there was no coup taking place in Venezuela, and but he had seen a tweet from the US President, backing Guaido. He acknowledged TT’s lack of an ambassador in Caracas, but said there was a chargé d’affairs “with all the right contacts” heading this country’s embassy right now. 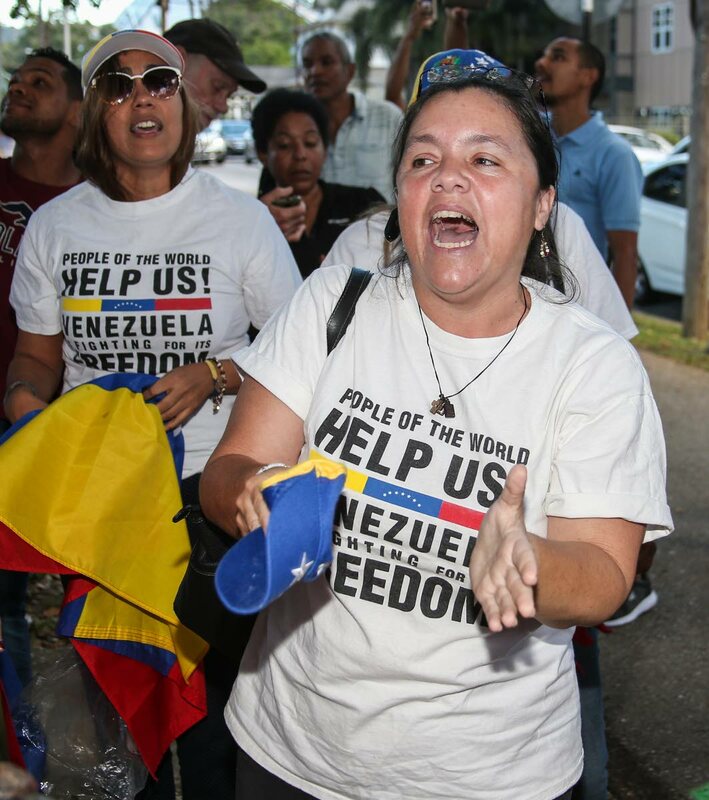 Chants of “Si, se puede,” Guaido’s campaign slogan echoing former US president Barack Obama’s “Yes, we can,” rang through the Queen’s Park Savannah, metres away from the Venezuelan embassy, as a crowd of his local supporters sang his praises for standing up to Maduro, a man they called a dictator who ruined their homeland. Guaido’s challenge to Maduro, they said, signalled a renewed hope for Venezuela. One supporter, who did not want to be named out of fear of persecution, said if this government did not want to recognise Guaido because of trade relationships, the least they could do is reach out to Maduro and encourage him to promise Guaido’s safety and even urge democratic elections. Another woman, an attorney who fled Venezuela because of threats to her and her family and now lives in Trinidad as a refugee, said she was very happy because this was the way to freedom. It will be some time, though, she said, before she can return home because of the recession in the country. Venezuelan Ambassador, Coromoto Godoy Calderon, did not respond to Newsday’s request for comment. Reply to "Chaos in Caracas"